Yo dawg, I heard you read blogs | House Unseen. Life Unscripted. I hear you! :-) And I owe you one for recommending this very thing, almost a year ago. Many, many good friendships, just for sticking my nose out there. I love blogging, too. And I hated using the word "blogger" and when I tell "certain" people I blog I sometimes wince at their reaction, BUT I would not dream of giving it up. I love it too much. And the FRIENDSHIPS... I felt the same as you. Like HOW could it be real, but MAN I've met some of my dearest friendships through my blog. For real! A blessing, indeed. Keep on bloggin away sistah! xo! I cherish those I've come to know through blogging. Wonderful people I will probably never meet in my lifetime but am thankful to share common ground with. We all walk in each others shoes from time to time as we read about the good, bad and sometimes ugly things each of us encounter. You, dear Dweej, have reminded many of us to keep the faith, you make us smile and feel warm inside. That's a very good thing! Have you ever seen the documentary "Trekkies"? If not, watch it. You have to. It's on Netflix streaming. Before I started blogging, I would look at people forming relationships with others they met at Star Trek conventions like they were the biggest freaks humanity ever produced. But now, having found this community of bloggers, I watch Trekkies in a completely different light. Instead of making fun of people I used to consider my social lessers, I am happy with the gift they've found in each other, and I am so so glad that human beings haven't let this post-industrial world strip away their ability to forge communities. I see myself and all you wonderful bloggers in those Trekkies. Minus the ears and forehead ridges, of course. yes! It's weird but it's wonderful! I shall force the hubs to read this and then he may understand why the word "blog" pops up in every other sentence and why he is now on a first name basis with you and my other faves as if you were all our extended family! "I write...er..blog. I talk to people online a lot. But I'm also writing a book that's kind of like my blog. No, I don't make any money. Why do I do it? I don't really know. I like it. Yes, I like it. You don't want to be my friend in real life, do you? This is uncomfortable? Ok, nice meeting you." If we ever meet in person, Dweej, we're drinking beer after I give you a giant hug. so glad to hear how much difference blogging has made in your life. And, never forget all that YOU have brought to our lives! So, so much! You bless my life daily, dear friend. 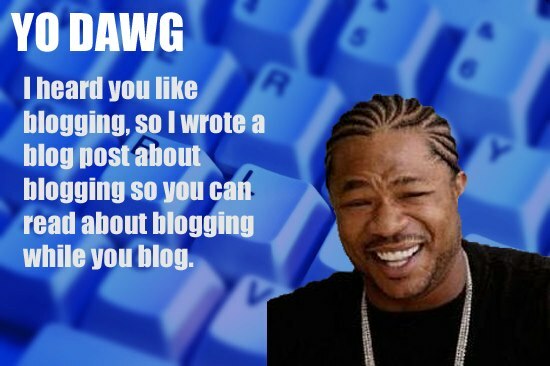 Can't even get past the graphic because I love Xzibit so much I am dying laughing hahaha!!! Have you seen the ones Catholic Memes has? Yes! Totally stole the idea from them. Hey Catholic Memes, if you see this: thanks! Oh man, this is so true. I have met some of my closest local friends through blogs. I actually met my husband online, so it wasn't a new idea for me, but I am grateful for the blogosphere! I know exactly what you mean! I started a blog just because, and I figured no one would ever read it. And yet, people do! And I have met people and am planning to meet up with more people in the next couple of months. I will admit that I still hesitate to tell non-bloggers that I blog. Because, like you said, it's weird to say, and they don't get it any more than we did before we started. You are so right. Just last week, a virtual friend, a blogger whom I follow, drove 1 hour and 15 minutes from northern Iowa to the library in my southern Minnesota town to hear me read and present on poetry. Beth Ann and her husband surprised me. I recognized her from her online photo as we had never met. But we shared so many similarities, a sisterhood that evolved into a friendship. I also met another blogger this past summer with Gretchen and her husband and kids dining at our home before attending a theatrical performance in my community. Blogging offers a multitude of blessings way beyond anything I could have imagined. Absolutely! I think of all of the friends I have made through blogging, and it is a beautiful thing. It got me through some very lonely moments in my life. Just last night I was trying to explain to my kids why I had Christmas cards hanging in my house from blogging friends I've never met. "But how do you know them?" From the computer! It's sort of a hard concept to grasp until you've lived it. And I'm so grateful for the real bloggy friends I lean on each and every day - like you!! The blogosphere truly is an amazing world in and of itself. I think we are all blessed to be a part of it. I wish I could win the lottery and pay for everybody to meet up. That would be one hell of a meet-up! I'm just at the very beginning of realizing the truth in this and I have been just as skeptical in the past. I still feel weird when I'll talk to someone and say "my friend so and so" and I feel like I have to qualify it with "well, I don't really KNOW her but...she's an internet friend." But maybe I shouldn't have to. Some of these friends are proving to be just as wonderful as the real life ones. And without the scariness of the phone involved. Also, can we please come up with a better word than blog? We can make it a thing, I know it. Agreed on all accounts! No more qualifiers (what exactly does 'friend' mean anyway?) and a brand new word. We can do those two things, I swear. I don't have a blog, obv., because I prefer to just comment on the totally talented awesomeness that is the blogs I follow. But I'm so glad I found yours one random day, and I don't miss a post. I would completely be friends with you if you didn't live in the frozen north and I didn't live in the balmy south. But maybe someday our paths will cross in real life! The blogs are my inspiration! Don't know where I'd be without them...thanks for yours! I'm still pretty new to all of this bloggy stuff, but I'm grateful that the word "community" means something much broader than it used to...and I'm glad you're out there doing your thing, 'cause it helps me do mine (whatever that is). Thanks. Virtually every statement of this post is true for me, minus the actual in-person meeting. But I will get to that someday! Thanks for sharing, Dwija. My irl friend Nancy called me last night saying something like, "I'm sorry I just thought of this but I'll be leaving for Michigan tomorrow and doesn't your friend Dwija live in SW Michigan? Because if you have something you'd like for me to drop off for her I totally would and could." And if logistics would have worked it all out I would have sent you some Christmas cookies and fresh baked bread via Nancy, because I consider you a friend AND a mentor. And mentors deserve fresh baked bread. Blogging has been a great experience for me in so many ways - most especially with everything we went through with James, the NICU, the pleading for a miracle... It was the most beautifully humbling thing to have so many "strangers" supporting my family. I made a friend like that once, back when I was one kind of blogger. We got to be best friends! But I changed, and she probably did too and we're not friends anymore. It's pretty sad. I see lots of people I want to be blog friends with now, but I haven't formed them yet. It'll happen maybe. Meeting people IRL from the internet has never been weird to me. It must be a personality combined with generational thing, but I've been doing it since middle school (gah where were my parents?) with almost completely positive results. I miss my old blog best friend though. I agree... I became friends with a small group of wonderful God-fearing people through an old blog of mine and after a few years we all met up at a Eucharistic Congress. It was awesome!